SAP BusinessObjects Dashboards and SAP BusinessObjects Business Intelligence 4.0 SP4, SP6. For more information, visit the SAP BusinessObjects Dashboardshomepage. This article describes the steps to make the dashboard files built with latest version of BusinessObjects Dashboards compatible with older version or to an older service pack within same version. The content in this article is intended for all those developers in Dashboards space who are dealing with the backward compatibility issue facing error message when opening files built on latest versions on the version of dashboards client they have one local machine. Steps in this article take an example of making Dashboards 4.0 SP6 XLF file to a Dashboards 4.0 SP4 compatible. The author has worked on several SAP BusinessObjects projects and has experience on using all the SAPBusinessObjects Business Intelligence platform tools. Author has experienceon working with SAPBusinessObjects mobile including designing and accessing BusinessObjects content (Web Intelligence Reports, Crystal Reports, Dashboards, Analysis and Information Spaces) through IPad / IPhone / Android. As some of us already know, any dashboard that was built on latest version than your local client version cannot be opened straightway from your machine as it throws error message as below due to backward compatibility problems. Below steps help us in making the file compatible to the version we use on our local machine, so that we can access the same for our activities without having to upgrade to version of dashboards on which the file was built. Import latest SP6 XLF files to your system through Dashboards 4.0 SP6 Client tools or if you have the SP6 file shared by someone through email and you have issues opening it with your Dashboards Client tools version, first thing to do would be saving it to local disk and then follow the steps below. Duplicate all the XLF file(s) into another folder, so that original file stays as is and conversion can be done/tried on duplicate copy to avoid loss due to any file corruptions etc. during the process. Right Click on document.xml and choose Edit option and update the tagversion=”x.x” in the file to the version dashboard file has to be revert to. (Update the version from 6.2 to 6.1 to deal with conversion of SP6 to SP4 within 4.0 versions of dashboards. If the conversion is form BO 4.0 SP6 to Xcelsius 2008 SP3 version number would be updated as 6.2 to 5.3 etc. Note: document.xml to be edited has to be outside the zip folder. Once version update is done, Copy the edited document.xml back into the ZIP file and overwrite the existing one in ZIP file. 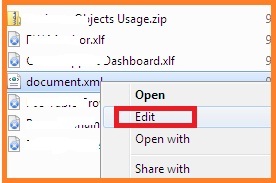 Convert ZIP file to XLF file using F2 key or Right Click>Rename and change the file name from .zip extension to .xlf extension making it backward compatible. Open the .XLF file with your local client version you should not see any error now, if you have done the above process correctly with appropriate version numbers.